This week retired FEI 5* and USEF "S"Dressage Judge Axel Steiner joins us to expand on his upcoming USDF Connection article on National vs. International Judging. We have an excerpt from the 2016 Competition Open Forum and part three of the series on rider biomechanics with Dr. Hilary Clayton. Axel Steiner, San Marcos, CA, is a retired FEI 5 * and USEF "S" dressage judge. Axel has judged at Olympic Games, Pan American Games, FEI World Cup Dressage Finals, and numerous other championships. He is also an L Education Program Faculty member and popular commentator for high-level competitions. 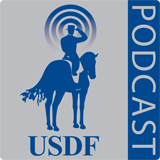 This week FEI Dressage Judge Janet Foy joins us to talk about her promotion to 5*status, USDF GMO Coordinator, Maggie Shell, explains the types of memberships you and your horse need for the competition season, and in the education segment, we start a new series on rider biomechanics with Dr. Hilary Clayton. Janet Foy, Colorado Springs, CO, is an FEI 5* Dressage judge, a USEF S Dressage judge, and a USEF R Sport Horse Breeding judge. She is a USDF L Education Program faculty member; a USEF Dressage Committee member; and a member of the USDF Judges and L Program Committees. She is the author of Dressage for the not-So-Perfect Horse and Dressage Questions and Answers. In this week's episode Jody Swimmer joins us to talk about her success with competing Saddlebreds in dressage, Marilyn Heath explains how much collection is needed to ride Second Level and we have part 2 of Helping Your Horse Perform its Best with Coralie Hughes. Jody Swimmer, PT, DPT, MAT, Louisville, KY is a physical therapist who competed her Saddle bred, New York City Slicker, at the 2016 US Dressage Finals in the FEI Intermediate I. Jody has also earned her USDF Silver Medal. Coralie Hughes, Coatesville, IN, is a Certified Practitioner of the Masterson Method of Performance Equine Bodywork. In addition to earning her USDF Bronze Medal, Coralie is a German to English translator and co-author of the Dressage Movements Revealed DVD set and The Dressage Horse Optimized.